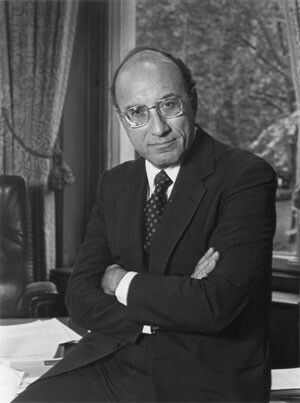 A Columbia University graduate, former faculty member, dean and provost, Michael I. Sovern was Columbia’s first Jewish president. An effective fundraiser for the Law School, as president, Sovern was charged with the task of providing a more secure financial foundation for the University thereby restoring institutional confidence. As president, Sovern explored funding in areas no one had bothered to look before. One of these areas was the patents on intellectual property created by Columbia faculty. Sovern’s Columbia was among the first universities to establish internal policies taking advantage of federal regulations allowing universities to patent discoveries made by faculty whose research was supported by federal grants. This, in conjunction with the sale of land under Rockefeller Center in 1985 and additional sources, allowed Sovern to quadruple the University’s endowment. In addition to fundraising, Sovern oversaw the admission of women to Columbia College for the first time in 1983 and successfully resolved the most explosive issue since the 1968 protests: South African divestment. The issue of South African divestment, which pitted the trustees against the students and the community, was carefully negotiated by Sovern who went “slow enough to provide time to bring along hesitant trustees but fast enough not to exhaust the patience of the senate or provide an excuse for student-led disruptions” (Stand Columbia, p. 545). In 1990, Sovern gained community approval for the development of property adjacent to the Health Sciences Campus, including Audubon Ballroom, where Malcolm X was assassinated. Sovern resigned from the presidency in 1993, returning to the Law School as a faculty member.